We've got the part in the above which I quote below for easy reference. Can you throw some light on the mathematics quoted hopefully in some kind of diagram? Now that which is of divine birth has a period which is contained in a perfect number, but the period of human birth is comprehended in a number in which first increments by involution and evolution (or squared and cubed) obtaining three intervals and four terms of like and unlike, waxing and waning numbers, make all the terms commensurable and agreeable to one another. The base of these (3) with a third added (4) when combined with five (20) and raised to the third power furnishes two harmonies; the first a square which is a hundred times as great (400 = 4 X 100), and the other a figure having one side equal to the former, but oblong, consisting of a hundred numbers squared upon rational diameters of a square (i. e. omitting fractions), the side of which is five (7 X 7 = 49 X 100 = 4900), each of them being less by one (than the perfect square which includes the fractions, sc. 50) or less by two perfect squares of irrational diameters (of a square the side of which is five = 50 + 50 = 100); and a hundred cubes of three (27 X 100 = 2700 + 4900 + 400 = 8000). Now this number represents a geometrical figure which has control over the good and evil of births. For when your guardians are ignorant of the law of births, and unite bride and bridegroom out of season, the children will not be goodly or fortunate. And though only the best of them will be appointed by their predecessors, still they will be unworthy to hold their fathers' places, and when they come into power as guardians, they will soon be found to fall in taking care of us, the Muses, first by under-valuing music; which neglect will soon extend to gymnastic; and hence the young men of your State will be less cultivated. In the succeeding generation rulers will be appointed who have lost the guardian power of testing the metal of your different races, which, like Hesiod's, are of gold and silver and brass and iron. And so iron will be mingled with silver, and brass with gold, and hence there will arise dissimilarity and inequality and irregularity, which always and in all places are causes of hatred and war. This the Muses affirm to be the stock from which discord has sprung, wherever arising; and this is their answer to us. Thank you, Peter, for giving me the opportunity of discussing this intriguing passage which has been the subject of much confusion and speculation over the millennia. Ficino wrote a whole book on it � Numero Fatalis. We have touched upon it quite a few times on this forum but I have always hesitated to tackle it on account of its great intricacy. You see, it isn�t really mathematical at all, at least, not in the way that we think of mathematics. The Greeks based their approach to number on geometry, and Socrates frequently uses this approach to bring out some kind of metaphor. Even his geometry isn�t straight forward, for it has a deep tinge of harmonics about it, a kind of wedding of number, geometry and music. In Timaeus Plato puts forward the notion of a harmonic Cosmos, where everything has its own place, and when disharmony arises it is by way of things somehow getting in the wrong place. What is uppermost in Plato�s mind at Republic 546 seems to be the impossibility of things to endure forever (sempiternally). Don�t forget that this passage occurs right at the begin of the fall from Aristocracy to Anarchy through the intervening states. He is trying to put all this on a cosmic level, and Socrates, not wanting to frighten us with the complexity of what he is about to describe, approaches it with quite a lot of irony, the Muses declaiming solemnly as if from a great height in the antique style of Euripides or Aeschylus. Perhaps Plato feels that this gives people who are reading more superficially a kind of get out clause, if they don't feel up to the task of interpreting 'the Musai', however there is no doubt in my mind that Plato�s initial listeners understood what he was talking about, for it is thought that Republic was first �performed as a play� to his inner circle. The passage talks of two numbers, one perfect and descriptive of the world of the gods and the other human, which through the means harmony and geometry foretells of humankind�s gradual descent into spiritual darkness where even the wisest fall into a kind of forgetfulness. Much can be said of this but I will leave that to the musings of you and your own group. Before attempting an explanation of this most curious of passages I need a day or two to get my notes together. Sometime this week it will be posted. Sorry, Peter, I am late with this. I have been trying to see if your Jowett translation (I believe) is possible to work with. He was no expert on Greek mathematics and his translation is misleading at key stages so I have finally decided to use the translation of James Adam who knew about these matters. Also his interpretation is sound, although I believe that the more recent interpretation by Ernest McClain adds another dimension to what Adam has to say. I hope you are agreeable to this. So here�s what I am going to do. First I�ll give the James Adam translation then what I think Plato has in mind for us. After that, in a follow up mail, I will give the background interpretation of this whole passage which is very rich. Some of this stuff is new. Here�s James Adam�s translation of the number part of the passage, I have split it into sections A to E.
A. Now for a divine creature there is a period which is comprehended by a number that is final. E.	the other, of equal lengths one way, the other way unequal:- on the one side, of one hundred squares rising from rational diameters of 5 diminished by one each, or, if from irrational diameters, by two; on the other, of one hundred cubes of three. The key, missed by all until James Adam (including Marsilio Ficino) was that to solve the problem one must start at the end and work to the beginning (i.e. E to A). Diameter means diagonal. The rational diameter of a square of side 5, is 7 (i.e. √49) the nearest rational (whole) number to √50. To be helpful Plato gives us two bites of the cherry, making sure we get the right answer (after all he does want us to understand what he is getting at!). So he gives us two solutions, one rational, the other, irrational. 2)	(√50) squared or 50, = 5000, minus 2 x 100 = 5000 � 200 = 4800. Given that these two numbers are described as �on the one side� and �on the other�, it seems reasonable to assume they form sides of a rectangle, a figure that is �of equal lengths one way, the other way unequal� an excellent definition of a rectangle, which we must remember is pre-Euclid. This is the second of two harmonies, we haven�t got to the first yet � remember we are travelling backwards. It is called a harmony on account of the ratio of its sides, quite common as a description in Plato�s time. But later I wish to show that it is also representative of a musical harmony. According to Plato�s definition above of a rectangle, �equal an equal number of times� must mean a square. we must accept this for now. What am I asking you to accept? -that both geometrical constructions have the same area but are different in side. 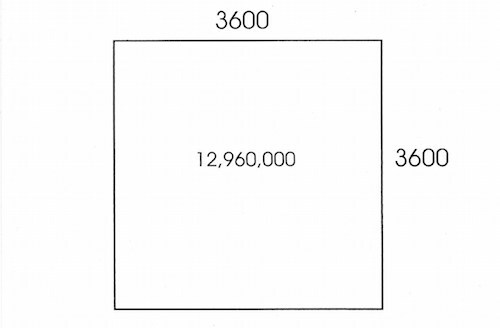 We know the area of the second is 2700 x 4800 = 12,960,000 (an extremely auspicious number as will be shown). Knowing this and that the first harmony is �equal an equal number of times, so many times a hundred� we know it is a square, and that if we let the side of the square (its �root�) be x then dividing 12,960,000 by (100x ) squared which gives √1296 or 36. So 36 x 100 = 3600 gives the side of the square 12,960,000. We now have our two harmonies, 3600/3600 and 2700/4800 which furnish the same geometrical area of 12,960,000. There are several ways we can go here but the end result is the same. As the term 'yoked' means multiplied I�ll use the straight forward method which is simply to multiply out 3 x 4 x 5. This gives 60 which �when thrice increased� which means raise from a single power of 60 to the fourth power. (i.e. 60 > 3600 > 216,000 > 12,960,000) which you see gives the number which furnishes the two harmonies. I will explain as best as I can sections A and B in a follow-up post, where I will also deal with the significance of the passage, and where Plato might have got his ideas from. It is fascinating. Please excuse any typos. I'll eradicate them as I see them. Sorry, Peter and Peter, hope this does not cause an unwanted diversion. Sch�fer also references Werner Heisenberg -- one of the most known world class physicist (for whom the Heisenberg Uncertainty Principle is named). �The elementary particles in Plato�s Timaeus are not substance but mathematical forms. �All things are numbers� is a sentence attributed to Pythagoras. The only mathematical forms available at that time were such geometric forms as the regular solids or the triangles which form their surface. In modern quantum theory there can be no doubt that the elementary particles will finally also be mathematical forms, but of a much more complicated nature.�  [emphasis added] And maybe, just maybe, not that much more complicated! And interpret the characters in which it is written. Thanks David, your post is on the button. Plato�s Pythagorean Ode, Timaeus, sounds more and more in line with modern scientific thinking as the years progress. I�ve recently posted on Plato�s radical approach to space and your post has inspired me to complete that little series, because I was going to tackle this very theme, especially with regard to the formation of DNA. It is true that despite Aristotle�s lack of enthusiasm for this particular aspect of Timaeus, the idea of a numerical basis to the universe opens an intriguing possibility. For these are not just any numbers but are harmonic and aligned to music - a fact which the brilliant Heisenberg probably mentioned at some point. These numbers then express themselves in the planar world in the shapes of the two fundamental types of triangle, (scalene and equilateral). According to Plato these triangles coalesce in different ways to form the building blocks of the elements. So, if we read Plato as he writes it, the kosmos is, in its inception, inherently musical. I leave others to talk of that much maligned phrase �Musick of the Spheres� yet I cannot let this pass without making the point that for the ancient Greek music was synonymous with poetry. - David, I sense you might have a Pythagorean ode bubbling up somewhere. All this needs to be sung about. By the way, Jason, one of our regular contributors, has been �singing the praises� of Timaeus as the proto-book of science for a long time now. I wonder if he might have something to say about this? Usually Plato is understood as banishing the poets. As Leo Strauss says they have a �bad press� in Plato. We call Iliad, for example, epic poetry. Sapho is a poet. And that is the sense which is meant by the modern world. It is exactly what Plato deplored. Presumably Peter means poiesis [in the sense of orginary dynamis], but this has nothing to do with any sense of our word poetry. Poiesis is another word for the becoming of being as the being of beings. It is the mode of time as time or the style of the activity of the fates, i.e., the way they weave. Nietzsche's creativity, i.e., that which was formerly the special prerogative of the god, is the word that means that in modern English. Of course it has been crudified, and now appears in the derived sense of creative art. What word does Plato have for true poetry or that which is like true music? Perhaps divination in the sense that Socrates divines (perceives by the pure nous), e.g., Justice without knowing what it is. It has to do with the common ground as envisioned without the interference of dialectic or philosophy. Socrates is not poetic because he strives to move upward to knowing. He knows that he doesn't know the truth, but he trys to know the truth. The poet battens onto what is divined without trying to know it. The poet is the visionary, or the one who sees. Nietzsche is not at all poetic, for his concern is the properly philosophic making of knowledge out of the ground, towards what is not true, but a �life-giving lie�. Nietzsche's point is the denial of what Peter, elsewhere, calls eternal patterns, somehow behind the eidoi themselves. It is the denial of proper or true purposes, and the affirmation of sheer becoming. Nietzsche does not stay with the sheer becoming, in order to �dance�, but he goes at once to the will to power or life-giving lie (the inculcating of being, as Peter�s hidden patterns, upon the face of becoming). Dancing is not poetry, but it seems rather akin. They both seem to leave all scientific effort resourceless. One can see the critique of Ortega against Martin Heidegger in the selection of poetry over this dancing. It dawned on me that Peter means that poeises is the activity described in the Laws. Music as the early teaching of man as man. As the formation of man. This is perhaps like the Nietzschean sense, provided we see that nothing true is to be found in this music, because it is pre-philosophic. Of course, it has nothing to do with poetry in either the modern or the ancient sense. And it is perverted by Plato, who lived later, and grafted his mathematics and philosophy onto it. Which you may greet, with some skeptical doubt. That�s a million miles long and a thousand miles tall? And made by the One who has infinite love. But you must find where you put it, in the sky up above? To throw open it wide, without any ego or greed. The third is wide open, Oh majestic soul! I bow down to your heart, which is purest of gold. I have barely mentioned it, hardly at all. Then polished and cherished, both known and ignored. Where pure beauty resides, before it is born. Which exists throughout all time and all space. And therefore believe in the one sided wall. That is brilliant, David. I warmly applaud your effort. Awful. I see this is the sight of the lazy logos. Yes, this is awful. Awful that the naysayer finds these posts �jejune� but yet has nothing better to do than come and try to spread their pessimism. They appear to be a logophile, yet they seem to throw semantics out the window; relying on imaginary concepts like historical facticity (whatever that is) as if our current historical understanding is somehow divine and beyond theory and not subject to change. I really like your poem too, what a great way to incorporate poetry into the philosophy forum! It appears though, that some people are awestruck and content with staring at the one sided wall! I should hope this is �always� true, that reality is different from what we thought it was. For if not, there would be no learning left, no wisdom to be discovered, nothing to strive for. If we reached reality, there would be no thought. Thoughts would be complete in themselves, and further thinking would have no reason. This is what makes �historical facticity� just an imaginary concept. This is what it means to be human. Nice job at interpreting this part of the Republic. All the numbers, geometry, and phrases make my head spin. I seem to veer in different directions with numerology, the meaning of shape, and the interpretation of the phrases, yet this seems to pull it all together in such a way as to give meaning to it all at the same time. Our normal way of interpreting things seems to undermine the actual meaning that Plato is trying to show, it is very difficult to catch it in its completeness. I am really looking forward to hearing the rest of your Plato-space posts as well as you tackling the formation of DNA, I bet it will be very interesting. "The past is the best prophet of the future." We started at the end of this passage which is called the Marriage Allegory, or Nuptial Arithmetic or Fatal Number, according to its various interpreters for reasons that we haven�t yet fully explained (though we will have to before this particular interpretation can be fully convincing). And after starting at the finale, the final cadence, as it is also a musical number, we worked our way towards the beginning, a method more strange for us than it would have been to Plato. The whole passage is divided into sections A,B,C D and E but there is more on either side of what is contained here, and we will have to take these �extras� into the final account. However we are in no hurry, and indeed, though it goes against the grain of what has gradually crept into the essence of the modern mind, this forum is a haste-free zone, and we may, in freedom and lack of care for a selfish result, match our ambulatory to the steady tread of the Athenian and his two companions on their way to the Temple of Zeus in Plato�s LAWS. Starting at the end, which in a subtle way is where most journeys start, we were able to deduce the final number, of 12,960,000 quite easily. The information was already there in sections E and D, in the form of two harmonies which arise out of something as yet unspecified in section C. The first harmony was 2700:4800 which is also expressed as a rectangle with sides 2700 x 4800, giving the harmonic number, 12,960,000. Having obtained that number it was easy to work out its square root as 3600, for 3600 x 3600 = 12,960,000. Section C revealed the number 60, resulting from the base 4 and 3 yoked to (multiplied by) 5; and that when it was increased three times it �furnished� 60 to the fourth power (60 x 60 x 60 x 60), confirming 12,960,000. All that previously � now we have to find where this 3:4 arose from. In other words we need to decipher section B. What we have already brought to B �by hindsight� is that 3 x 4 x 5 = 60, but we need to justify, by going in the other direction, i.e. by going forward, how the words in B support this interpretation. The clue, according to Adam, lies in a passage of Aristotle�s Politics. Aristotle comments that �the base containing the ratio 3:4 yoked to 5 furnishes two harmonies, i.e. when the number of this figure is made solid� [Politics, 1316]. 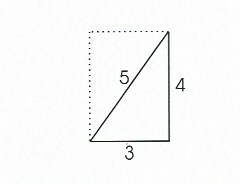 Adam takes it that such a figure is laid hold on three distances, with four limits and can only be based upon a rectangle of width and height 3 and 4, and that further, this rectangle will have a diagonal of 5 distances, and therefore contains the most famous of all Pythagorean triangles, that with the dimensions of 3, 4 and 5. So what is to be �made solid� (according to Aristotle) isn�t the area of the rectangle but the area of the Pythagorean triangle it contains. This is (3 x 4)/2 or 6. And this is the number that Adam insists is to be �made solid� or cubed. So 6 cubed is 6 x 6 x 6 or 216 - and this, my dear friends, is the number of section B. Working backwards again we may now tackle the rest of section B of Plato�s own text, fitting to it what we already know �by hind-sight�. 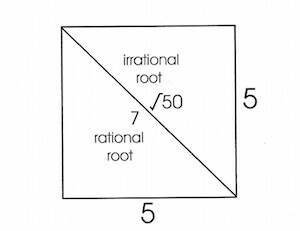 It is not unreasonable to think that these three numbers of the Pythagorean triangle must be the subject of multiplications of root by square. If it is we have a confirmation of Aristotle�s �made solid�, for if we let root be x then square will be x times x or x squared. So applying multiplications of root by square � as x is the root of x squared, and, likewise, x squared, the square of x, root times square gives x cubed. (3 x 3 x 3) + (4 x 4 x 4) + (5 x 5 x 5) or 27 + 64 + 125 which sums to 216 or (6 x 6 x 6) thus confirming Aristotle�s assertion and Adam�s interpretation of it. There is no more actual maths in section B, but in my next post, we�ll consider into what 216 could mean, and with it all the other numbers in the whole passage. As I said before, I think you will find it very interesting. This all hinges on the Greek word dunamis � �power� and I�ll look at this in a future post. Thanks so much for your detailed responses. Our group meets again this Friday and we will have lots to consider and reflect on. I look forward to reporting back to you all on how we managed and with further questions that might arise. What a blessing to have access to such a wealth of knowledge and experience. Lots of love from darkest Africa!
" historical facticity (whatever that is) as if our current historical understanding is somehow divine and beyond theory and not subject to change." It indicates something closer to the reverse of a thing "somehow divine and beyond theory and not subject to change". Facticity is opposed to abstraction [it is �finite� to use the popular jargon]. It means concrete experience, of a stone, a human being in a post office. The fact is opposed to the true thing, the eternal truth and the theoretical law. Fact, factum, means something closer to the thing that shows itself, i.e., the phenomenon. There is a trivial ambiguity due to the current usage which connects objectivity, and so the fact, with science (i.e., with science as mathematical natural science, the modern concept of nature]. Objectivity refers to the knowing of knowing beings. The securing of the same knowing for all discerning beings. We all know what a chair is, what a stone is, what a smile is, it's part of the objective spirit of our culture, to use Hegel's language. The qualification �historical� indicates that it changes. It�s not a matter of skepticism due to comparison of the many doctrines, but the positive regard of the immediate historical ground through thinking through the reality-character of the essences of the things concretely grasped. We persevered with the explanations you provided and found them very interesting but I cannot say the penny dropped. Perhaps you can suggest further material we can study in relation to Socratic Mathematics and also including the music of the spheres. Do you know if anyone has recorded the kind of music Socrates might have found useful? We have however moved on and are now on Book X and our group have found the discussion on the value of the poets fascinating especially with regards the rational and irrational parts of our soul. It suddenly became very clear how this descent into anarchy takes place where we place more and more reliance on the world of shadows and images ignoring that rational aspect. There was a question as to why, despite our being aware of the pitfalls of irrational thought, we still avail ourselves of its folly. A bit like being in a parallel universe. Looking through the thread I realise that I haven't completed my account. I'll try to do so over the weekend. I'll also try to help you understand it as well. It's worth the perseverance. Plato, after all, expected his readers at the time to understand the wit in Socrates exposition here. We, nearly a couple of millennia later can only interrogate his words as best we can, keeping in mind Socrates advice about the unexamined life not being worth living. I'll try to address this issue, and perhaps through a little light upon it. here was a question as to why, despite our being aware of the pitfalls of irrational thought, we still avail ourselves of its folly. A bit like being in a parallel universe. A good definition of duality!